The testimony given by expert witnesses in cases involving cot death has been called into question by a string of high-profile court cases. The latest acquittal, of mother Angela Cannings, has sparked a review of all criminal cases involving possible cot deaths. Lord Goldsmith, the Attorney General, said expert evidence alone did not make a conviction safe and those convictions involving such evidence will be fast-tracked to appeal. The UK Register of Expert Witnesses compiles a list of experts who are vetted before they can take the stand. Its editor Dr Chris Pamplin said he welcomed the review. 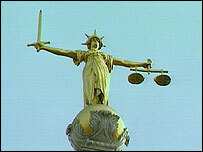 He told the BBC Radio 4's Today programme the special nature of expert evidence needed special handling by the courts. Referring to the expert whose testimony has come in for the most criticism, he said: "Roy Meadow did come to have that element of desirability in the eyes of the CPS. He added: "Undoubtedly, there are some expert witnesses which when they stand up in court bring with them a very strong persuasive element to their evidence. "And their evidence takes on a greater weight because of the way they deliver it." Lord Goldsmith's announcement came hours after the Court of Appeal explained why it acquitted Mrs Cannings last month. The court halted all prosecutions in cases which could involve cot death. Dr Pamplin said this gave a clear indication that contested expert evidence should introduce enough doubt in the minds of a juror to prevent a conviction. In the Angela Cannings, the evidence was disputed yet the jury still reached a decision beyond all reasonable doubt. He said the adversarial nature of the UK's judicial system meant expert evidence was prone to being distorted by the directions of the solicitor. "Where the court, hearing opposing opinions from two experts, still comes down on one side of the argument and comes to a finding beyond all reasonable doubt, that's when things seem to be going wrong."